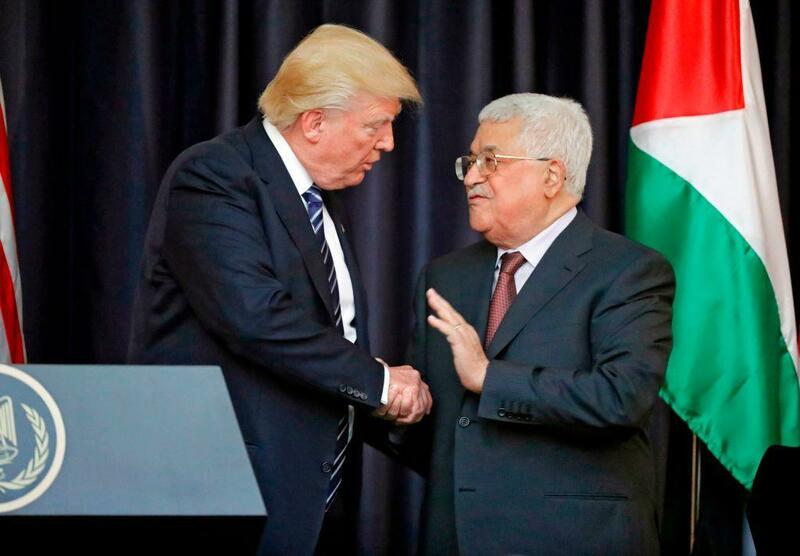 An Israeli television channel has claimed that US President Donald Trump shouted at Palestinian Authority (PA) Leader Mahmoud Abbas in talks held during Mr Trump’s visit to the West Bank last week. “You tricked me in [Washington] DC! You talked there about your commitment to peace, but the Israelis showed me your involvement in incitement [against Israel],” Mr Trump is alleged to have shouted at the Palestinian leader, an outburst that was followed by several minutes of shocked silence, said Israel’s Channel 2, citing an unnamed American official. The alleged quotes were reported in Hebrew, and then tweeted by reporter Udi Segal in English. The PA has denied the report, saying that the 23 May meeting went well. The Channel 2 report certainly does not match up with the warm words exchanged between the two leaders during a televised media conference after the private meeting in Bethlehem. “Meeting you in the White House earlier this month given us hope… and optimism of the possibility to make the long-standing dream of lasting peace come true,” Mr Abbas said, emphasising the Palestinian leadership’s desire for a two-state solution. Mr Trump and Mr Abbas met in person for the first time at the White House on 3 May, when the US president boldly stated his desire to do “whatever is necessary” to achieve a lasting peace deal in the decades-long Israeli-Palestinian conflict despite the failure of several previous US administrations. In the meeting earlier this month Mr Trump’s administration called on the PA to do more to tackle violence against Israelis and end payments to the families of those killed or imprisoned by Israel. The day before the alleged argument Mr Trump met with Israeli Prime Minister Benjamin Netanyahu and President Reuvin Rivlin in Jerusalem. “I had a meeting this morning with [President] Abbas and can tell you that the Palestinians are ready to reach for peace,” before turning to gesture towards Mr Netanyahu, seated behind him. “In my meeting with my very good friend Benjamin, I can tell you also, that he is reaching for peace. He wants peace,” the US President said. Mr Trump warned, however, that such a historic undertaking will not be easy. The president’s visit to Israel and the West Bank was part of his inaugural trip abroad as president, a whistle-stop tour taking in meetings with world leaders in Riyadh, Jerusalem, Bethlehem, Rome, Brussels and Sicily. Mr Trump used a speech in the Saudi Arabian capital to impress upon representatives from Muslim countries that they and Israel faced a common enemy in the form of Islamic terrorism and the possible threat of Iran.